We have been visited by a couple of young rabbits. They have been playing about and eating the grass on our lawn outside the kitchen window. Very cute and entertaining. However, Hubby has spotted a large rabbit (Mum or Dad?) in the vegetable garden sizing up the broad beans - so not so cute! We are surrounded by fields with plenty of sandy banks where rabbits can make a home. Usually sometime in the spring a farmer has a shoot and the numbers are cut dramatically. But one of the fields has been sold with the School House so the rabbits are running free this year. I tried my hand at selling some of our produce. We have occasionally put out punnets of plums and apples by the front gate with an honesty box which brought in a few pounds - but more importantly got the fruit to good homes before they went rotten. Our local volunteer group Coleorton & New Lount Volunteer Group had a fund-raising table-top sale event in the community hall just up the road so I thought I'd support them and see what I could sell. 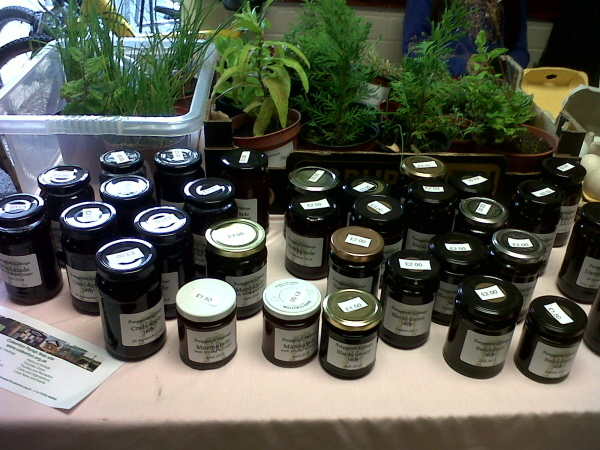 I took along 36 jars of jam and marmalade in various size pots and a selection of herbaceous plants and herbs. Didn't make a fortune. Of course a lot of local people make jam and have fabulous gardens so weren't really interested in buying more. Had some interesting discussions about what variety of raspberries to grow and how to get jellies to set! Reminds me of a story my old sales manager used to tell: Two shoe salesmen got off a plane in an undeveloped part of Africa. "Oh no!" said the first "No-one wears shoes here. I'll never meet my target on this patch!". "Oh great!" said the second "No-one has any shoes here. I'll be able to sell several pairs to everyone and collect my biggest bonus ever!". It's the way you look at your market. Clearly my local market is knowledgeable about plants so would appreciate unusual specimens, and jams and preserves that are extra-special find favour. I sold a couple of jars of marmalade to a lady who says she likes to try other people's marmalades for ideas for her own, and jellies found favour for people who don't like pips! 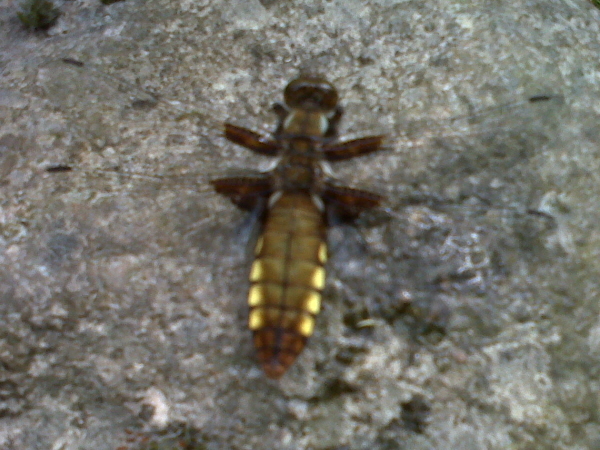 The lack of posts in the last week or two does not signify that nothing is happening! 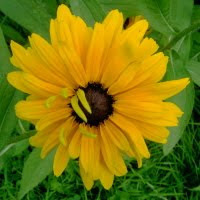 The weather has been warm, hot at times, with sufficient rain to keep everything growing like mad after the early spring. There's been a flurry of sowing, planting out weeding, cutting down, digging over to make more space... And while we have just a few hours a day to get out there nature has 24 hours to do its stuff! We generally start things off in the greenhouse or conservatory, sowing seeds or beans into suitably sized pots, modules or trays. This brings them on quickly and avoids frost damage. 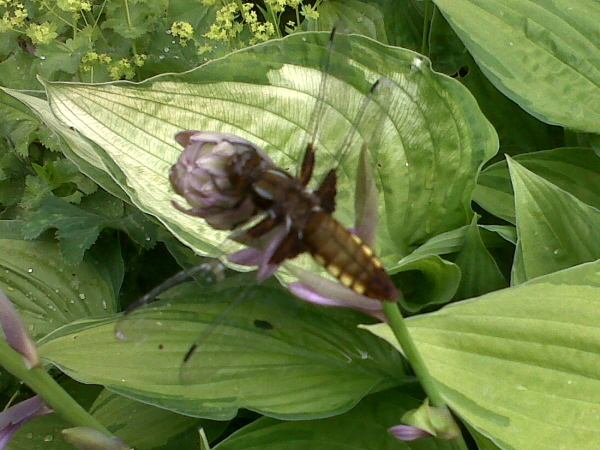 It also reduces predation from slugs, weevils etc. The exception to this is potatoes (obviously!) and broad beans. The broad beans seem to be very resilient. This year we planted 30 in the ground and 30 in pots in the conservatory and planted out later. All the beans germinated (saved from last year's harvest) but now there's no difference between the pot-sown and soil-sown plants. 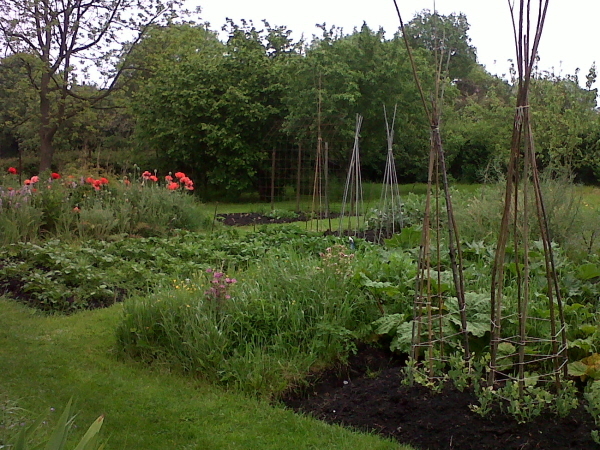 Sweet peas and french beans on the "wigwams", potatoes, broad beans. 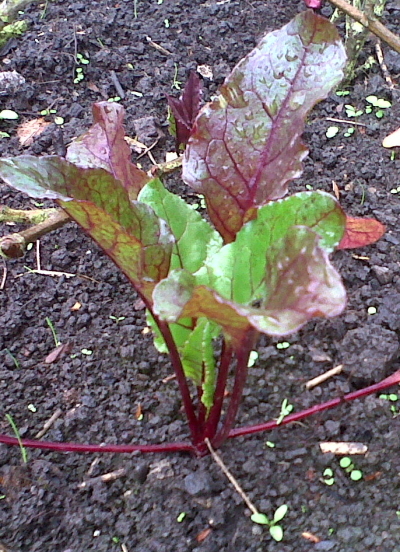 Young beetroot. 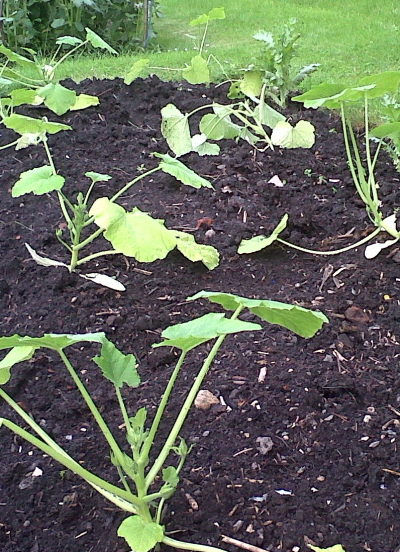 Grown in modules and planted out into the raised bed. 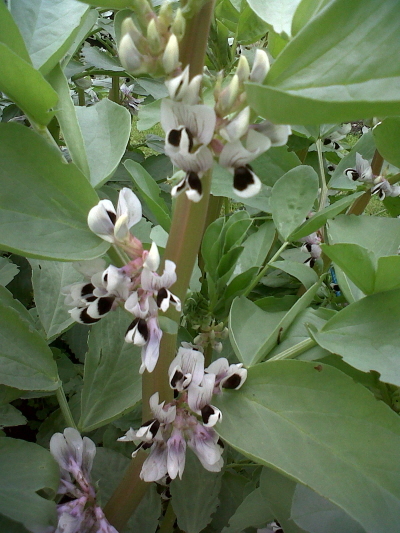 Broad bean flowers. The bees are busy there. our mature heap went on first. We've also planted out 72 baby leeks in the bed by the greenhouse.